Under the careful guidance of our fully qualified "Archery GB" coaches Ian and Martin, they will teach you how to master the ancient art of archery. 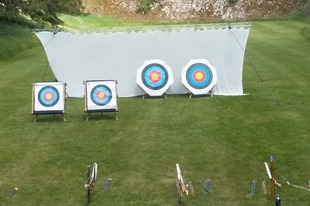 Our Target Archery sessions are held at our outdoor target range at Greenlands Farm Village, near Carnforth, LA6 1JH. A short equipment introduction session, which will acquaint you with the bows and arrows that you will be using. Safety briefing and range etiquette. Our qualified staff will take you step by step through safe shooting techniques, with time to overcome any nerves. The aim of the lesson is to teach you the basics of barebow shooting. Then it’s time to show off your new-found skills. Suitable for families, individuals and parties, this activity is suitable for ages 6+ with all children accompanied by an adult.